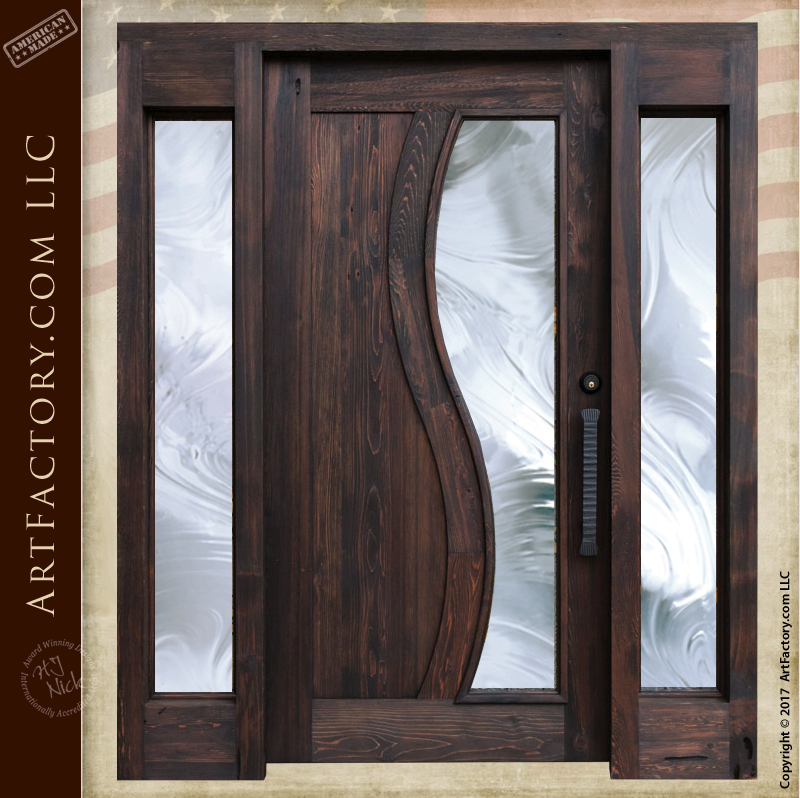 At ArtFactory.com we specialize in making modern doors inspired by history. Despite its modern look, this contemporary style entrance door is build in the same, old world hand and craft as our historically inspired doors. The wood frame and main door panel are handcrafted from solid, natural, full length timber. Additionally, like all of our wood products, it is hand hewn, using mortise and tenon joinery. In other words, this contemporary style entrance door is built to last into antiquity. Finally, the door is finished to fine art quality using a multi-step hand rubbed process. This process blends the finish into the grain of the wood so that it won't flake, fade, or crack like paint. The door has a divided half wood, and half glass panel design, with a curved art nouveau style divider down the middle. The door also features dual sidelights. All of the glass panels are thick, security grade, insulated glass. This door (as shown) features a decorative frosted glass. All of our doors that include glass are available with any style of glass you prefer, from clear, to frosted, etched, or decorative. If you are looking for a true work of fine art, we also offer this door with hand cut stained glass. We even offer bullet resistant glass for those in need of maximum security. The contemporary style entrance door as pictured features our hand hammered door handle (HH143) with a black patina finish. Like all of our custom doors, the contemporary style entrance door includes fine art, hand forged wrought iron hardware. You can choose from the modern style hand hammered door handle as pictured, or any of our custom door handles. Our master blacksmiths hand forge each custom door pull using old world techniques. This means with hammer and anvil over a coal fired forge. Additionally, all door hardware, including hinges and slide bolts, are solid wrought iron hand forged by our expert blacksmiths. To top it all off, all custom door hardware is advance patinated using our multi-step, hand applied, iron oxide process. This process infuses the patina to the metal at over 1000 degrees so that it bonds to the metal. This makes for hardware that will stand the test of time, and look better with age. Get a quote on the contemporary style entrance door of your dreams by giving us a call today at 1-800-292-0008.